SGCS is dedicated to nurturing students’ growth and development in independence, maturity, personal responsibility and leadership. We aim to develop each student’s sense of place in the world and their responsibility to people who are less fortunate. At St George Christian School we seek to encourage and develop a culture of service and generosity in order to help our students develop their awareness of global needs and, from a Christian perspective, to see they can make a difference in the world. Beyond Ourselves is a focused initiative designed to provide students, staff and parents with opportunities to practically live out the message of the Gospel and extend the love of Christ through acts of service to our world. One of the main focuses of the Beyond Ourselves program is the Vanuatu Mission Initiative. 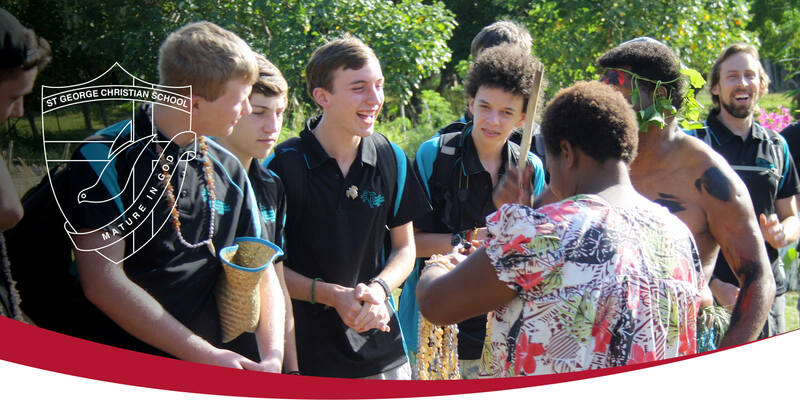 Since 2009, SGCS has sent teams of students, staff and parents on annual mission trips to Vanuatu where participants have the opportunity to actively engage and assist those in physical and spiritual need. The eleven day mission consists of ministry, programs and practical help to local primary and high schools as well as children with disabilities. Our aim is to keep sending teams of students, staff (and parents) Our annual mission trips offer an opportunity for students and the SGCS community to be generous with our resources, time, hands and hearts in order to meet the deep physical and spiritual needs of the community in Vanuatu. We will continue to go ‘beyond ourselves’ with the message of love, hope and salvation through Jesus Christ.